Earlier this morning, the Philadelphia Flyers announced that the organization had once again acquired goaltender Brian Boucher, this time from Carolina – along with defenseman Mark Alt – for minor league forward Luke Pither. No matter how far away Boucher gets, he seems to keep making his way back to where it all started – Philadelphia. In 10 games last season, Boucher had a 3.41 goals-against average and a .881 save percentage, while battling a groin injury for much of the season. 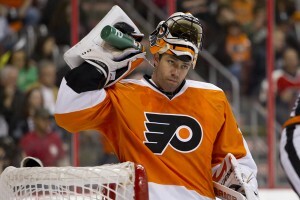 The move adds depth in goal for the Flyers, who have no guarantees in starter Ilya Bryzgalov or his backup, Michael Leighton. The 36-year-old journeyman will likely spend the season in the Adirondacks with the Flyers’ AHL affiliate. Boosh, as he’s called, has long been a fan favorite in Philadelphia. In 1995 the Flyers selected Boucher 22 overall in the hopes they had found its goaltender once current netminder Ron Hextall called it quits. He was the third goaltender to be chosen by that point in draft – J.S. Giguere went to Hartford at 13 and Martin Biron went to Buffalo at 16. He would spend three seasons with the Flyers but the team gave up on the Boosh experiment, went a different direction in goal and traded him off in 2002. Brian Boucher returns for his third stint with the Flyers’ organization. He would bounce around to several different teams before surprisingly making his way back to Philadelphia in 2009, agreeing to a two-year deal that made him the veteran backup. After a slew of injuries, Boucher found himself with the starting job as the 2009-10 regular season came to a close. The Flyers made the playoffs on the last game of the season, thanks to Boucher, who stoned New York Rangers forward Olli Jokinen to preserve a 2-1 shootout win for Philadelphia. He’ll forever be known for the biggest shootout win in franchise history, as well as what he did soon-after. Boosh went on to play 12 games in the playoffs and although he posted a 6-6 record, he had a 2.47 goals-against average and a .909 save percentage. He gave the Flyers a chance to win each game and after he led a surprising upset over the New Jersey Devils in the first round, Boucher was injured against the Boston Bruins and had to watch most of the Flyers’ historic 0-3 comeback from the bench. He returned as the backup in the Stanley Cup Finals but at that point it was Leighton’s job, not matter what happened. Flyers fans still wonder what could have been in the Finals had Boucher been healthy. It was that run – and his professionalism both on and off the ice – that left the city with a soft-spot for Boucher but today’s announcement came with mixed feelings from fans. Many believe he’s too old and that it’s simply time to move on from Boucher. He might just be an insurance policy for the Flyers but after what happened in 2010, we wouldn’t be shocked if somehow he makes at least a couple of appearances in goal this season. The Flyers give up a 23-year-old forward in Pither who split time this season in the ECHL between the Trenton Titans and Wheeling Nailers, scoring 11 goals and 14 assists in 35 games. It’s believed Carolina made the deal to make room for goaltender Dan Ellis to assume the backup position for the Hurricanes.